For the moment, lets assume that the octave sectioning described previously divided the information in the best possible manner for detecting calcifications at a 35 ^m image resolution. But what happens if we change resolution? It may be safe to say that, if the resolution is doubled or halved, we could pick different expansion images and our technique would still be "the best" within this hypothetical situation; that is, if the images were scaled to down 70 ^m (lower resolution or halved), the d1 and d images would most likely be the most relevant choices. However, if the scaling was not applied by a factor of two (or half) we might end up with a less then optimal representation for detection purposes. where f is a radial frequency variable, m locates the central band, a controls the bandwidth, and l alters the cut-off. This filter has more adjustment leeway or freedom compared with the symmlet wavelet but at the cost of orthogonality. Certainly m and a may be varied and a series of band pass filtered images may be generated the sum of which will not generate the raw image back. However, orthogonality is not always important. In order to apply the new donut filter for calcification processing at an arbitrary image resolution, its operating parameters must be selected. There may be theoretical methods to approach this problem. However, an empirical method was used here based on signal-to-noise ratio analysis. For this, known calcification areas were hand-marked using a wide range of specimens from many images. Likewise, several normal image regions were labeled on the same images. The area markings for both normal and abnormal (calcification containing) tissue types were of the same size that changed depending on the particular image resolution. 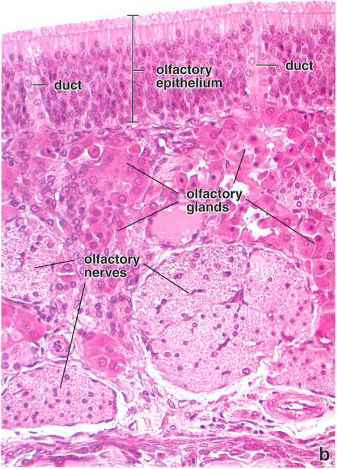 The calcifications were considered as "the signal" and the normal background tissue was considered as "the noise." These images were processed repeatedly while varying m and a of Eq. (13.2) and calculating the power for the respective image regions. By averaging the power from the signal and noise regions across all images and forming the average signal-to-noise ratio provided the means for finding the best average or overall operating parameters. 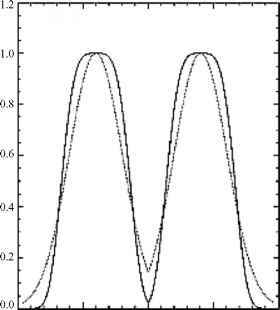 The parameter l was determined prior to this by a similar rationale and was set to 4; if l = 2, the profile was Gaussian. Figure 13.8 shows slices through the donut filter for l = 2 and l = 4. Note the difference in the cut-off properties. 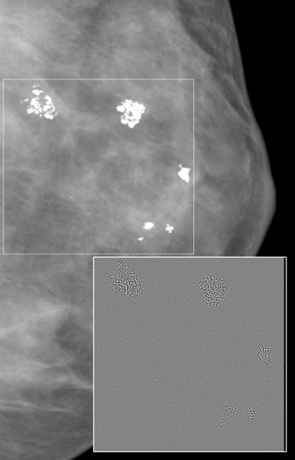 Figure 13.9 presents a section of a mammogram digitized at 60 ^m and 16 bits/pixel containing a calcification cluster associated with cancer. Figure 13.10 presents the symmlet wavelet output and Fig. 13.11 shows the donut filter output for the section of Fig. 13.9. The comparison of the two images in Figs. 13.10 and 13.11 indicates that more information was maintained with the donut filter than the symmlet wavelet approach something that impacted shape analysis and classification results as we shall see in the following sections. Figure 13.8: Slices through the donut filter in the Fourier domain for I = 2 (dashed curve) and I = 4 (solid curve) versions. Note the difference in the cutoff behavior of the two versions. 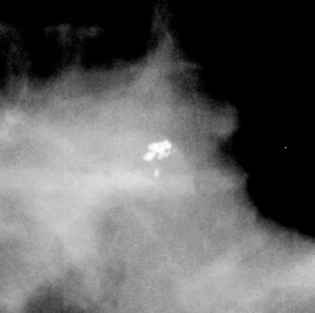 Figure 13.9: Original ROI (512 x 512 pixels) with a calcification cluster associated with cancer. The ROI was obtained from a screen/film mammogram digitized at 60 ^m and 16 bits/pixel. Figure 13.10: Output of the symmlet wavelet filter for the ROI of Fig. 13.9. Strong edge effects are present with this filter that often remain in the final segmentation step (see section 13.3.4) and interfere with classification. Figure 13.11: Output of the donut filter for the ROI of Fig. 13.9. Smaller edge effects are observed in this case and improved edge definition of the objects of interest. Figure 13.12: Main section of an FFDM image of the left breast of a patient with benign clustered calcifications enclosed in a white box. 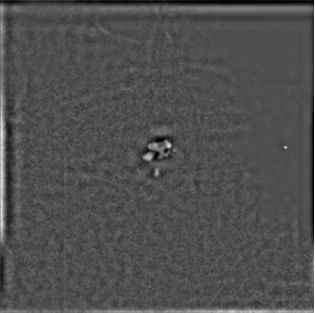 Image was acquired with GE's Senographe 2000D digital system at a resolution of 100 ^m and 16 bits/pixel. The insert shows the region with the calcifications after filtering with the new donut filter in combination with a prewhitening approach. Note that the background is subdued (gray value information is removed) and calcifications remain as outlines that can be easily extracted. prewhitening process amounts to removing the influence of the mammogram's natural spectral form before applying the filter. Preliminary results suggest that this preprocessing step could increase overall detection performance. The edge artifacts present in both the wavelet-filtered and the donut-filtered image are due to the wrap around effect in the convolution process or the periodic wrap around present in the discrete Fourier Transform. Basically, the filter kernel slides off one side of the image and appears on the other. Thus, for all practical purposes, the kernel slides over what appears as a discontinuity. The artifact appears more pronounced in the wavelet-filtered than the donut-filtered image, which may be due to the iterative convolution inherent to its application. In all fairness, we have not discussed the characteristics of the actual mam-mograms, digitized or direct digital. Following, we will give a short description that will assist the reader in understanding the difficulties in processing mam-mograms either automatically (computer vision) or manually (human vision). Evidence indicates that mammograms, regardless of resolution, obey an inverse power law with respect to their power spectral density [51-53]. Specifically, the power spectrum of a particular image drops off a 1 /fY, with y on the order of three. This indicates that the images are predominately low-frequency fields with long-range, although not well defined, spatial correlation. Power laws are inherently termed self-similar and often the term fractal is used. This implies that there are no preferred scales as with the human voice for example. There are debates as to whether an anatomical structure like the breast could be truly fractal. But, it is reasonable to say that the image statistics will quite often vary widely across the image from region-to-region due to this spectral characteristic. As an aside, wavelet expansion images may be considered as multiresolution derivatives (derivatives with respect to scale) in a loose sense. Effectively, the differencing produces images (the expansion image) that are not as irregular as the raw images. The reader interested in this line of reasoning could consult Heine et al. [52, 54] and the references therein.